Unless it’s incessantly coming from the mouth of a two year-old, “why?” is one of my favorite questions. And “how?” is right up there with “why?”—they’re practically cousins. Why was it set up this way? How does this work? Why did you (or it) do that? Why is DHCP doing this? How does DDNS work? Why is the network set up with three subnets separated at the second octet (and not the third)? What if? When? How many? Why?!!! Why not?!!! If I … ? Be inquisitive and curious. Wonder where the setting is that you need to bring up the system that’s down. Is it on the next tab? What if you push this button? Can you undo that? Is this problem like another one you’ve solved? Can you draw parallels with other situations? Can you extrapolate the answer based on some other scenario you’ve faced? If I use the mobile app at the airport for my boarding pass, what will the TSA agent doodle on? How does the bar-code reader get past the glare on my mobile’s screen? Where will they stick my baggage claim check? Will this work? What if I try? Do I have time to try? Don’t stop with just asking questions, though, do something! 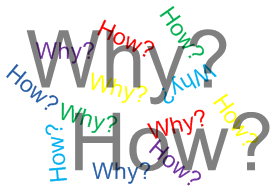 Asking “why” can lead to analysis-paralysis and no execution. Asking “where” can lead to wild goose chases. Don’t let that stop you from doing something—execute! So be curious. Be inquisitive. And go do something. This entry was posted in Leadership, Other Thoughts. Bookmark the permalink.